If you are looking for the best window washing and window cleaning company in Duluth, Georgia, then look no further. Sparkle Plus Window Washing and window cleaning Service is a reliable window cleaning company that services both residential and commercial clientele. Our company was established with the purpose of providing professional and courteous service to our clients. We offer a variety of affordable services for your business. We take great pride in caring for your facilities, which is why all work is performed by our own experience professionals. We believe that our commitment to providing quality and consistency every time we service our customers will separate us from the competition. We at Sparkle Plus realize window cleaning is time consuming, difficult and sometimes dangerous to do. Why not let a courteous, conscientious professional take care of this tedious chore for you on a regular basis, so your windows will sparkle year round making you the pride of your Duluth neighborhood. Sparkle Plus Window Cleaning can handle your Duluth GA commercial window cleaning needs. We specialize in interior and exterior washing servicing store fronts, retail locations, mall locations, car dealerships, restaurants, banks, gas stations, and low-rise buildings. We also offer pressure washing for all of the above mentioned properties. The city of Duluth is located in Gwinnett County, Georgia. The city had a population of 26,600 according to the 2010 census. 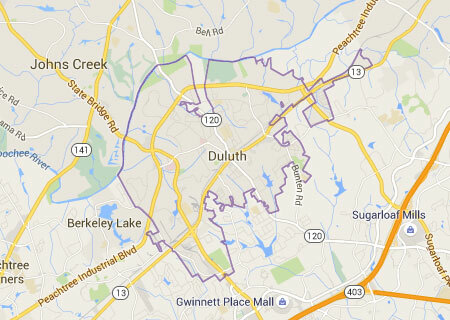 Duluth is a suburb of Atlanta, close to Interstate 85. It is home to Gwinnett Place Mall, Gwinnett Civic and Cultural Center, Arena at Gwinnett Center, Hudgens Center for the Arts and Red Clay Theater. It is also home to Gwinnett Medical Center – Duluth, an 81-bed hospital constructed in 2006, as well as GMC's Glancy Campus, a 30-bed facility located near downtown. Nearby attractions include Stone Mountain and Lake Lanier. The agricultural manufacturer AGCO is based in Duluth. According to Forbes magazine, Duluth ranks 26th in the nation in America's Best Places to Move. It was also named the Best Affordable Suburb in Georgia by BusinessWeek magazine. Whether you are spring cleaning, entertaining, impressing clients, getting ready for the holidays or selling your home, why not treat yourself to the best window washing and cleaning service that Duluth has to offer. Sparkle Plus Window Washing Service takes a great deal of pride in caring for your home or property. We believe our commitment to provide quality and consistency is what separates us from all other competitors. For more information, contact us at 770.321.5757.